"The Blood, Breath and Life"
Welcome to "Blood, Breath, Life"
Just as light is the only force that can conquer and overcome darkness, so is life, the only force which can conquer death. Adam's blood was already flowing through his body, but there was no life in his body until God breathed life into him, of His own life. Chemical substance that we call blood carries life. If, a person loses his blood, he looses his life. 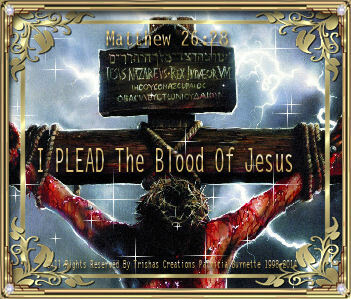 No blood means, no life, because the blood carries the life, isn't that amazing how God created life! Life is a spiritual substance that we call blood that carries life, but it must have a physical carrier. As believers in Jesus Christ, our bodies are the temple of the Holy Spirit! The Holy Spirit and life of God are in us! God is Amazing and He has created marvelous things in Our Lives, and we owe it to Him to Love Him and Praise Him!